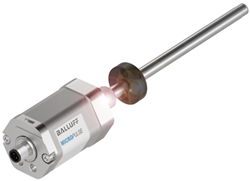 According to Scott Rosenberger, Product Marketing Manager for Balluff's measurement sensors, the addition of the IO-Link interface provides significant advantages, especially when compared to the more traditional approach of using analog interfaces for hydraulic cylinder position feedback. "Using IO-Link as the interface in linear position monitoring applications eliminates all of the issues associated with implementing and managing analog signals in industrial environments," says Rosenberger. Noise, grounding and measurement calculations are all a thing of the past. "Implementation of IO-Link version 1.1 allows more and faster data transmission, and makes it possible to incorporate advanced functionality: including bi-directional communication, sensor-level diagnostics, and network-based parametrization," Rosenberger added. Over the IO-Link interface, the sensor reports the micrometer engineering units, completely eliminating controller mathematics to convert analog signals to digital data.